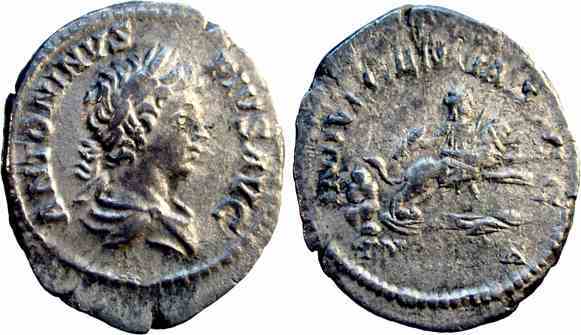 Silver denarius, 18mm, 2.4gm, issued AD 205. Rome mint. Obv: ANTONINVS PIVS AVG, Laureate, draped and cuirassed bust facing right. Rev: INDVLGENTIA AVGG IN CARTH, Dea Caelestis holding thunderbolt and sceptre on lion. References: Sear 6806, RIC 130a, RSC 97.